Hooray!It's the Toronto Comic Arts Festival this weekend. If you're going to be in town, you gotta come. It's awesome, and totally free! How can you say no? 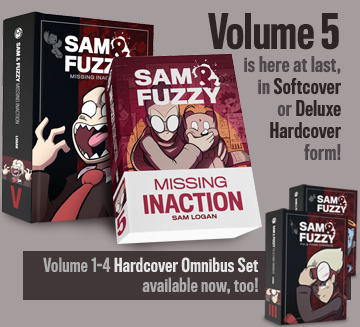 I'll have a wide array of books and shirts in tow, including both hardcover and softcover copies of the Sam and Fuzzy Omnibus. And of course, I'll be doing plenty of commissions. 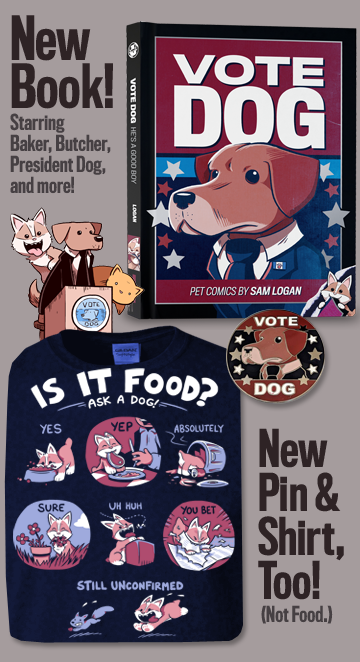 You, your pet, your favourite Sam and Fuzzy character, your favourite Skylander... whatever. Oh, right! Yes, absolutely. The downloadable PDF version of the Omnibus is now available to buy in my Gumroad store, alongside all my other ebooks. Though it lacks the fancy trappings and immense wait of the physical versions, it does contain all the same content, including the many, many exclusive new comics and bonus features. I pencil and ink my comics on paper, then scan them at 600 dpi and add the panel borders, black fills, grey shading, lettering and speech bubbles all in Photoshop. The font I use is one a reader made for me, long ago, out of a sample of my own hand-writing. Everything in the comic, from the line art to the letters, is aliased -- meaning, drawn in 2-bit black and white pixels only, with no grey "softening" around the edges. That's the ideal format for black and white printing, provided your source material is 600 dpi or higher -- it keeps everything crisp looking! You'll want to turn anti-aliasing on when you resize the comics for the web, though, or they will look all pixel-y when they are shrunk down. We return on Monday with more comics. See you then! Just a quick note today, as we're off to Toronto for this weekend's TCAF! Hope to see a bunch of you there, Torontonians. It's that time of the year... the time for Comic Arts Festivals! This weekend, you can find me at TCAF in Toronto. Once again, the upper level of the Toronto library will house a broad bevy of online cartoonists, including many of my Topatoco pals. And as always, the show is totally free to attend! Sweet deal, right? And then later this month, on the 24th and 25th, I'll be back here in Vancouver for this year's VanCAF! This year's show is going to be the biggest one yet, with new guests like Kris Straub, Natasha Allegri and Aaron Diaz. And of course, VanCAF is ALSO totally free to attend. It is an amazing time to be alive. If you're coming to VanCAF, might I suggest picking up one of our VanCAF VIP packages? For $15, you get an exclusive Tony Cliff print, a set of art postcards drawn by ten of our guests (myself include), a backpack tote, tickets for the VanCAF raffle (which has some pretty crazy prizes), VIP seating at panels, and a bunch of other stuff. It's kind of an insane deal, to be honest, and buying one will help VanCAF bring in even more great guests in the future. Hooray!